We have been implementing every possible checks to make sure design is verified but what have we done to check our test bench ? How do we make sure that our test bench has covered everything that needs to be covered w.r.t to specification and test plans ? Here is the place “Functional Coverage” and “SVA” comes in picture! Before we start on few guidelines to follow while working with functional coverage, I would encourage you to refer various posts on functional coverage and assertions to get high level idea on architecture and usage. Click on 1, 2, 3! Now, Basic questions can come to mind is, "what is the difference between code and functional coverage?". Let’s understand it at high level and then we will move forward to understand guidelines for functional coverage. Functional coverage and code coverage both are contributing highly on sign off criteria for verification. 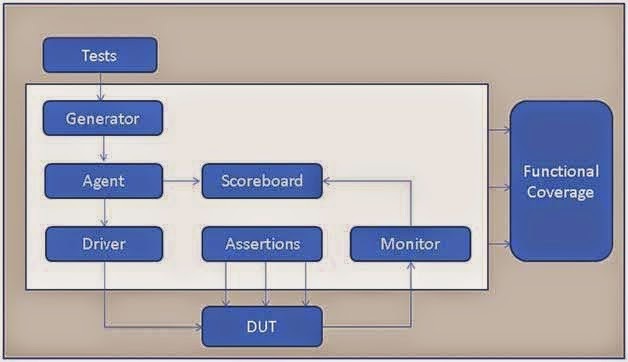 Verification engineers have to make sure that their test plan and test environment is intelligent enough to satisfy the code/functional coverage closer. Code coverage is generated by tool with the help of the simulations generated by the test environment. So test environment should be random and intelligent enough to make sure design is covered as a part of code coverage and designer should be in agreement while code coverage review. There should be valid comments with reason for all exclusions for code coverage w.r.t to design specification. Functional coverage should be written such a way that it should be able to capture all identified functionality while defining the test plan. Coverage and assertions are very important entity in the verification process and there are few guidelines that would help in verification process. You should have a coverage matrix with the list of cover point details w.r.t to your test plan scenario and there should be link of traceability between test scenario and cover point. For guidelines on SVA, please refer to this article ! Stay tuned to understand functional coverage sampling mechanism !